EDIT: I updated this article on 12/28/2016 with a new options and some more pics, and I'll try to continue to keep it updated as it's one of the most popular posts here. Anyone familiar with the Dark Eldar scene knows that there is one big, burning question from anyone with eyes, limited funds, and even a passing sense of aesthetic rigour. 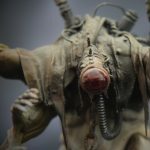 What am I going to use to convert Grotesques? 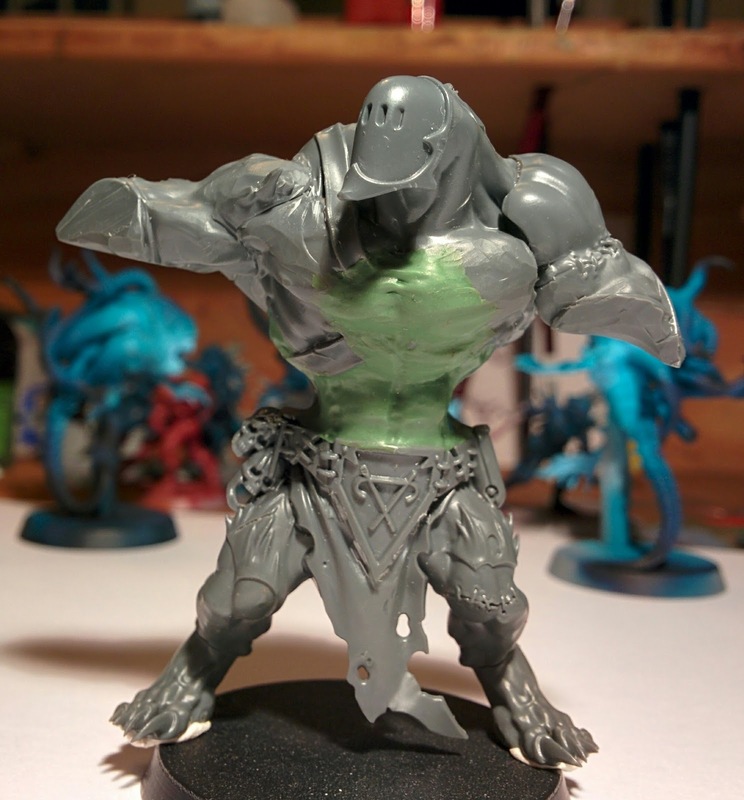 "But," I hear you saw, "GW already HAS a model for Grotesques." Yes, that is true, but the thing is expensive, statically-posed, lacking on additional bits, and, well, UTTERLY GROTESQUE! I that way I guess it's perfect for representing the unit that it is meant to, but I certainly cannot respectfully field that "Breakdancing Bigfoot"(TM someone brilliant who isn't me) in my army—particularly when I put so much work into converting so many of my models. But, of course you know about that since I've already detailed my decision to use them here, and the finished products of my last round of grotesque conversions here. So why rehash that now? Because the idea to convert Grotesques from Paulson Games Bioterrors was just the beginning. That was the easy bit. My real fit of madness came with the idea that there needs to be other places where Grotesques show up in the Dark Eldar list because what self-respecting Haemonculus doesn't want more giant walls of twisted flesh running around? I've mentioned this a bunch of times in different places before, but for the sake of completeness, I'll restate it here. There are at least two other entries in the codex that are BEGGING to have Grotesques stand in for them because the statlines are so similar. This one requires less of a leap. The statlines are similar, they are both mounted on a larger base, and though there are defined beasts that Beastmasters are meant to use in the codex, I feel like Beastmasters would happily bring on all kinds of beasts, and the Clawed Fiend statline is just meant to represent the idea of a large beast, just as the Khymera statline represents a medium beast, and the Razorwing statline represents a small/swarm beast. In my mind you could just as easily represent the three levels of beast with ever larger rat models. I have Coven-themed ideas for the small and medium beasts as well, which I'll get into in a later post, but I wanted to start with a way to rep the large beast and to use the entry to sandwich in more Grotesques. In my Coven of the Unmarred fluff, I talk about how the Coven draws a lot of its flesh stock from a real-world bits bin, which is called The Pit. When the master Haemonculi of the coven are dissatisfied with one of their creations, or with a particular creature from the Real Space harvests, they chuck it into The Pit. This ones a bit weirder, so bare with. I've decided to rep Sslyth with another kind of Grotesque, but this is based almost purely on the statline and the fact that they Feel No Pain. It's common practice to convert Grotesques from Everblight Warspears. It's a great idea, pioneered by the very talented Eye of Error, but, for me, these Grotesques are too clean, too neatly portioned, too...controlled. 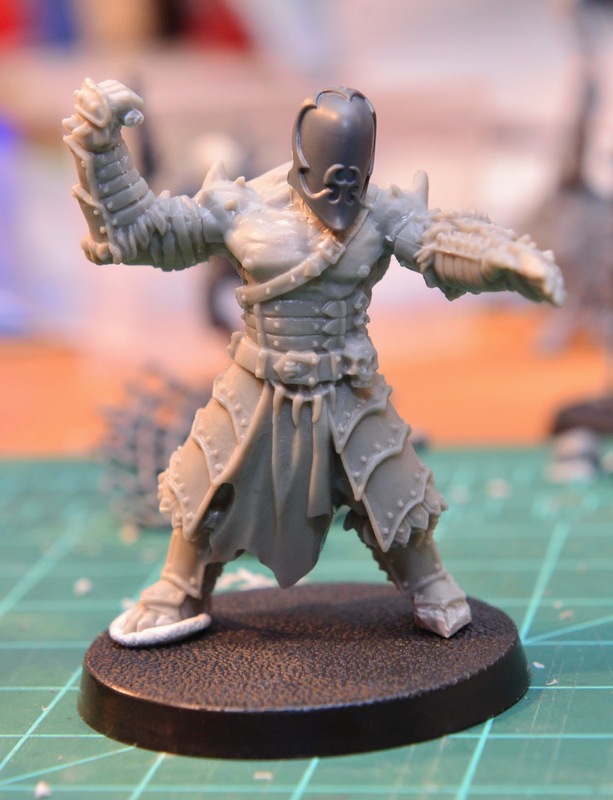 ...but in the end they make a very nice, very BEEFY Grotesque model with just some simple armswaps from the Talos kit. If you don't care about you'd rather make a big, fleshy statement on the tabletop and don't worry about making the hitbox on your models bigger, I would 100% go with these. If anyone has other models they're using to convert Grotesques, please share away. 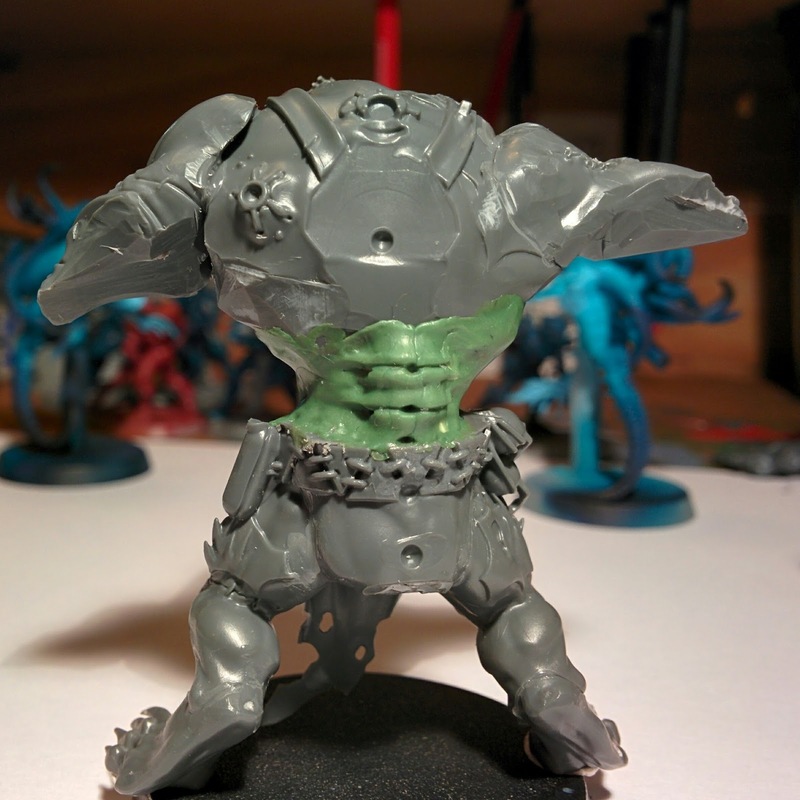 Dang I like those grot models you have done, and the alt model works really well for what younhave done to them. I really really like the idea of the vargheist model as a clawed fiend substitute. I have been scratching my head on hoe to do one for my DE and yoy have given me some ideas. 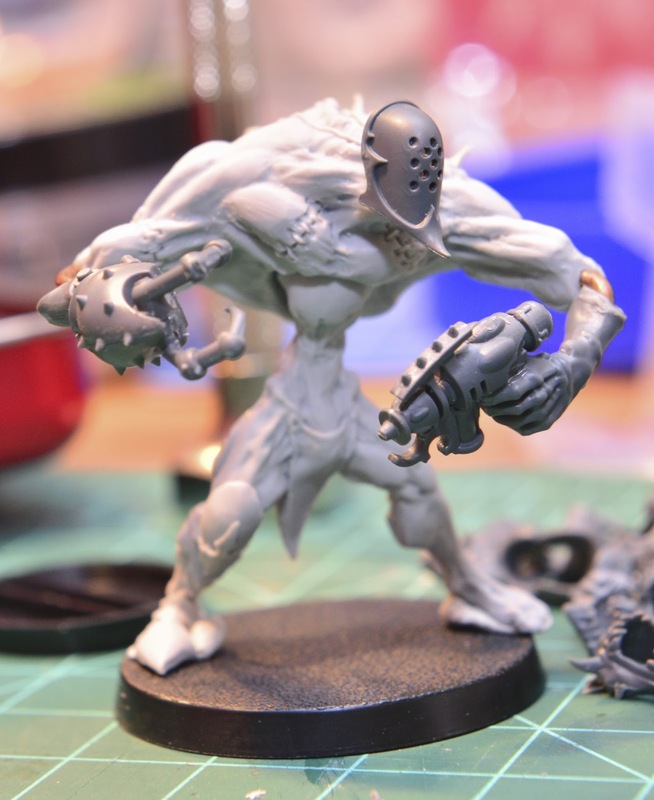 Not too sure on the wrack model yet tbh but I will wait and see what your awesome converting skills do to it. See my reply to your other comment about using lions as your Clawed Fiends, complete with a Lion Tamer. Or, if lions aren't twisted enough (after seeing those lollipop men), why not grab some Puppetswar quadrapedal daemon dog/cat things (they look great and super creepy with their multiple eyes), then sculpt some lion manes on them? The existing Rat Ogres from that Isle of Blood or whatever set are decent, but they seem so over done for Grotesques now. What's more, the majority of people who use them never bother to ACTUALLY REMOVE THE RAT FUR FROM THEM!!!! If you're going to do something, do it right!